I recently ordered some thin nail art brushes on ebay and have been dying to give them a try. But when I did try to use them I was very disappointed to find that I just can't work with them. I'm not sure whether the brushes aren't very good or I'm not very good at using them but I did find it much easier with the brush included in my Models Own nail art pen. My Models Own pen is black though and I needed white for what I wanted to do so I decided to go for a different design and tried some matte reverse dots. I noticed a couple of days ago that Boots currently have up to £1.50 off some of Rimmel's nail varnishes and as Rose Libertine caught my eye and I had £2.19 floating around in my purse I decided to get it. This was a very Rimmel based manicure as I used Rimmel's new Nail Nurse Nail Rescue as a base coat, Rimmel 60 seconds nail varnish in Rose Libertine and Rimmel's Pro Matte top coat. 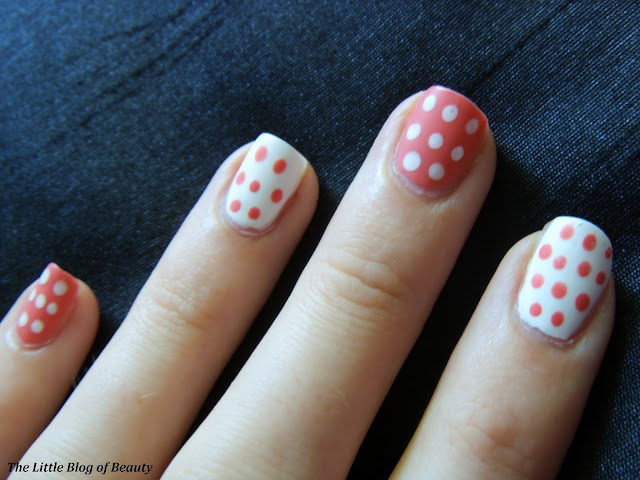 I also used Sinful Colors in Snow Me White, Seche Vite and a dotting tool. 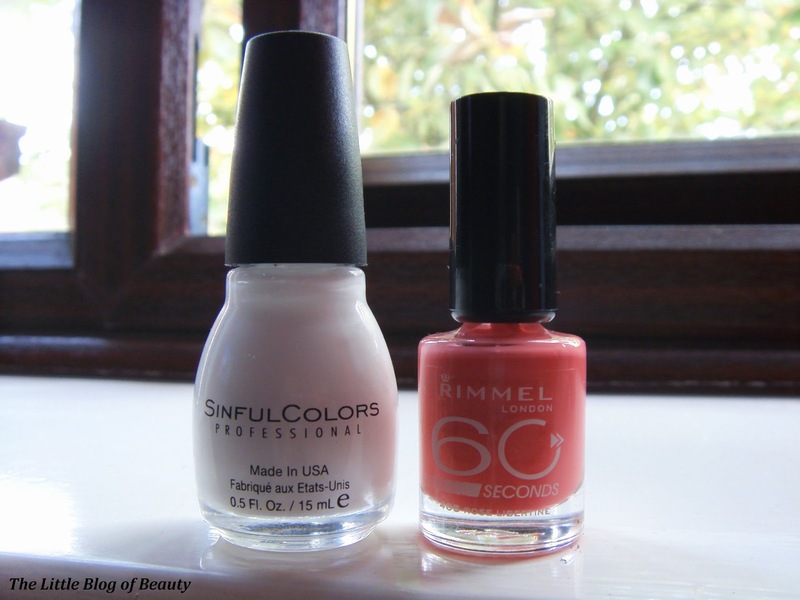 After applying the base coat I then applied Rose Libertine and Snow Me White on alternative nails using two coats of each. I followed this with a coat of Seche Vite to seal the base colours ready for decorating. Once dry (which really doesn't take very long with Seche Vite, which is why I use it) I then just dotted each nail with the opposite colour to the base colour. Once dry (actually I was a little early so some of the dots are slightly smudged) I then applied the matte top coat over the top of each nail. 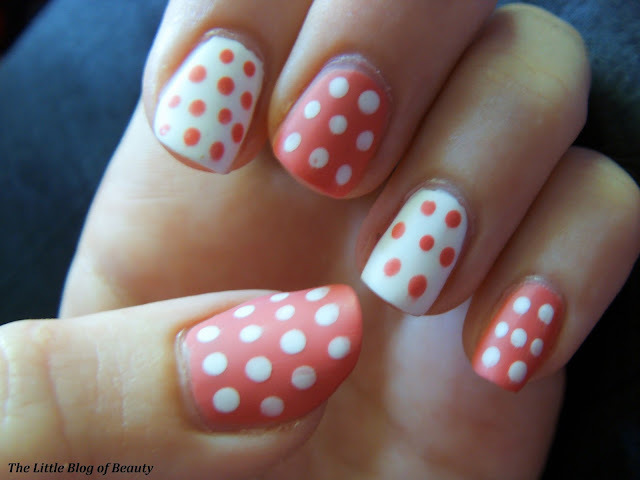 What do you think of matte reverse dots? These are sooo cute! I think if you were to do a Matt version darker colours might be a better idea? Such a pretty design! I love the peach shade too, I will have to read some reviews about it.